A missal provides all the prayers, hymns, and readings necessary for the celebration of Mass over the course of the year. This deluxe 15th-century missal made for use on the altar was given to the church of St Lawrence in London by William Melreth, alderman, textile merchant of Broad Street and eventually member of Parliament, probably just before he served as Sheriff of London. This page gives some of the directions and prayers for the introit or introductory procession.The directions are written in red, while prayers are in black. 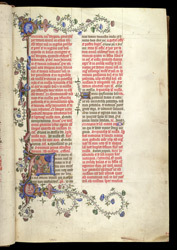 The historiated initial marks the beginning of the hymn based on a psalm verse to be used on the first Sunday in Advent. The kneeling figure looking up to the radiant face of God may represent a layman or possibly a biblical figure. Verses of the hymn were sung alternately by the priest and choir (antiphonally). The next verse is marked with the abbreviation 'ps' in red.